What does it mean to go off-grid? The image below is one of our off-grid solar installations with a battery bank (not shown) provides an older farmhouse with enough power in Nova Scotia. Off-grid solar PV installation, 2016. There are a couple of options for off-grid systems as described below: DC and AC. DC off-grid solar power systems are most often used to power DC appliances in RV’s, boats, and cabins, as well as farm/ranch appliances like cattle gates and rural telecommunications systems when utility power is not accessible. DC solar power is less expensive than AC solar power because an inverter is not required to convert the electricity produced by solar panels and stored in batteries from DC to AC. But DC solar power does NOT power standard AC appliances. See Option 2! Off-grid solar power also stores DC electricity in batteries. The addition of an inverter allows this system to convert DC electrical current coming from the batteries into AC or alternating current. AC is the standard form of electricity for anything that “plugs in” to utility power and is the appropriate current for common household appliances. While AC off-grid solar power systems are more expensive because of the cost of the inverter, the appliances you are able to use are less expensive and there are more kinds of appliances to choose from. Off-grid solar systems can be cheaper than extending power lines in certain remote areas. Costs of remote, rural overhead transmission lines in Nova Scotia can be much higher than the cost of solar power, depending on the distance the power lines need to be run as well as other factors. Less stress. More time. Did we mention less stress? I went to the woods because I wished to live deliberately, to front only the essential facts of life, and see if I could not learn what it had to teach, and not, when I came to die, discover that I had not lived. – Henry David Thoreau, 1854. 1. A backup power source should be included. There’s no power if your batteries are depleted and the sun isn’t shining. Off-grid solar systems are designed with a certain amount of autonomy – ie., your battery bank may be sized to provide up to 3 days of energy, or more. But if the weather doesn’t cooperate and you don’t have a backup source of power, your batteries could get depleted and you’ll be stuck with no power. A backup power source like a generator is an additional expense both to install and to maintain, and generators themselves are often considered noisy and not eco-friendly but necessary. 2. Requires a hands-on approach. If you’re considering off-grid living, you need to know that it’s not a hands-free lifestyle. This doesn’t have to be a disadvantage, but it could be for some folks. Off-gridders typically have a sound understanding of the electrical loads in their system. They can modify their lifestyle in times of reduced energy production (long stretches of cloudy days or other weather), and they often have or develop a strong DIY attitude to go with it. If you want to store power, you need good batteries. A battery bank typically needs to be replaced after 10 years. Some maintenance-free (AGM) batteries are warranted for only 7 years. Batteries are complicated, expensive and decrease overall system efficiency. In an off-grid application, absolutely everything that draws power has to be very carefully considered. Appliances and equipment, even the Energy Star rated ones, that are perfectly fine for conventional use may be totally unsuitable for off-grid living. Properly sizing your solar PV system for an off-grid application is critical. We always advise energy conservation before investing in a renewable energy system, and that is particularly true with an off-grid lifestyle. Living off-grid has unique considerations. Energy monitoring will be critical. Off-grid designs are based on your lifestyle/needs, including how many days of autonomy (ie., days relying on your battery bank) you want, and by your budget. Starting from scratch? Try a load calculation form. There are lots of load calculation forms available that try to help you size the off-grid solar system you’ll need to support your lifestyle. 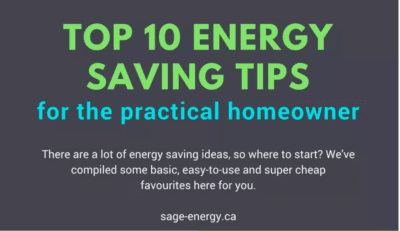 You can even find an online version on Nova Scotia Power‘s website. We also have a basic online calculator you can try. As off-grid properties are sometimes very remote and therefore difficult for us to access for a site assessment, we will work with you to try to gauge your needs as closely as possible. Again, it is critical to understand each and every electrical load you expect to include in your system. What might be a small, insignificant load in a grid-tied system can result in a poorly-performing and inadequate off-grid power supply. Or you may have added a few bits and pieces over the years, and unwittingly affected the performance of your system. These are links to articles about off-grid living or blogs from folks who are already living off-grid in Canada. Please note SAGE Energy does not endorse all statements made in these articles, nor would we necessarily agree with how the systems described are set up. Off Grid Nova Scotia is a public facebook group that may provide some interesting resources. Check our Links page for more.